Cats of all ages tend to shut down and go into "slow mode" during travel. 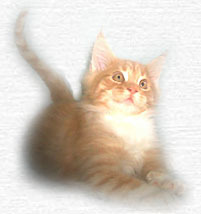 A new kitten, even an outgoing, gregarious kitten, may seem shy when they first arrive. Partly this is a coming back to full Speed process and partly being faced with a multitude of new experiences all at once. Start the kitten out in a small space that can be just theirs for a while. A bathroom connected to your bedroom or other quiet place is good. They should have a litter box, water and food available. A secure bed is a good idea. The carrier that the kitten travels in is a good choice if there is space for it. 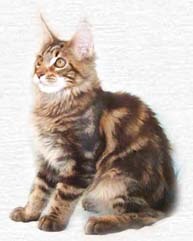 As the kitten settles in open the door and let him explore nearby rooms a little at a time. 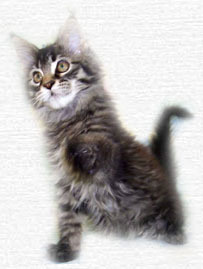 As the kitten starts exploring, show them the way back to their litter box occasionally. All of our kittens are litter trained, but little guys can get lost at first. If you have a large home, a kitten may need a litter box in more than one place. If you are a kitten just starting out with this stuff, it can be a long way back to the litter box. If there is another cat in the household, keep them separate for a little while. A good way to introduce the local cat to the new comer is to let them play "footsie" under a door for a while. Then let the old cat meet the new cat on the new kitties secure territory. Cats may take a little while to become acquainted but they usually work it out successfully. When the kitten first arrives, fresh water and dry food is a good start. We feed Science Diet Dry Growth and Science Diet Canned Maintenance. 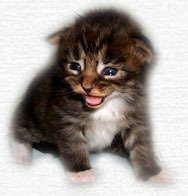 If the kitten is very hungry when it first cranks back up, it might over eat on canned food if it is available. After a few hours, putting out some canned food is all right. We feed the Science Diet, with very few treats. 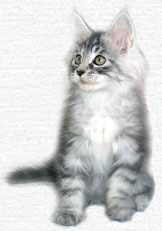 Many cats as they grow up, wean themselves off canned food, eating less and less of it as time goes on. If they do, do not be concerned. Dry Science Diet is a complete diet and is probably better for the cat than canned food. If you suddenly switch foods, expect diarrhea. This is almost always the cause of loose stools in a new cat or kitten. If you find it necessary to change their diet, do so gradually, mixing a little more of the new food in each day until the change is complete. A week should do it. We are a quiet spot here at Willowplace. We seldom play the radio or TV and there are no children or dogs. We live in the country and one of the first things everyone says when they visit is: "It certainly is quiet here!" Because of that, loud noises or excited children may intimidate the kittens for a little while. If they have a quiet spot to hide in, they may do that for a while, but kittens are kittens and they are going to come out and play. They love a quiet pet and snuggle while they are getting acquainted. If they get scared a little loving works wonders. 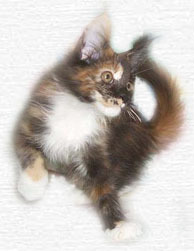 In our experience, a week or so will acclimate a kitten to even the noisiest household. A good way to introduce a kitten into the larger, more exciting home is to put it in its carrier and sit the carrier in the middle of things. The kitten will hear and see everything, get used to the smells and noises. When the kitten gets used to things, they are going to want out. Open their door and let them explore the area. They can always run back to their safe carrier if they need to.